Using an anti theft steering wheel lock for your car is one of the best ways to keep your car secure. Not only does it act as a deterrent to any potential thieves but it is also virtually impossible to remove without making excessive noise. The best steering wheel lock is the Disklok Enclosed Lock, which is Thatcham Approved and comes in three different sizes. For those on a budget and require an easier solution, the Club 1010T Lock is the best value for money. Now that relay crime is becoming more of an issue, physical anti theft devices such as the steering lock are becoming as popular as they were back in the 1990’s. Using a Thatcham approved anti theft lock for your steering wheel is also a great way to reduce your car insurance premium. Even though all modern cars have advanced immobilizers and alarms, they can be hacked quickly via a specialized computer software used by criminals. Old-school devices are coming back into fashion in order to tackle the new era of stealing cars, which is of course relay crime. The steering wheel lock is the main and most effective method and comes in several different options to suit your car. 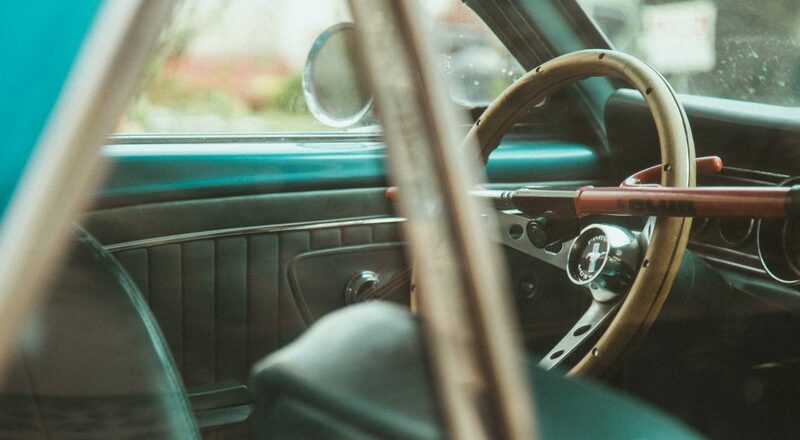 If you have a classic car or one that could fall victim to relay crime, investing into a quality steering lock is highly recommended. Below is a list of the best steering wheel locks for your car that are easy to use and act as deterrent. 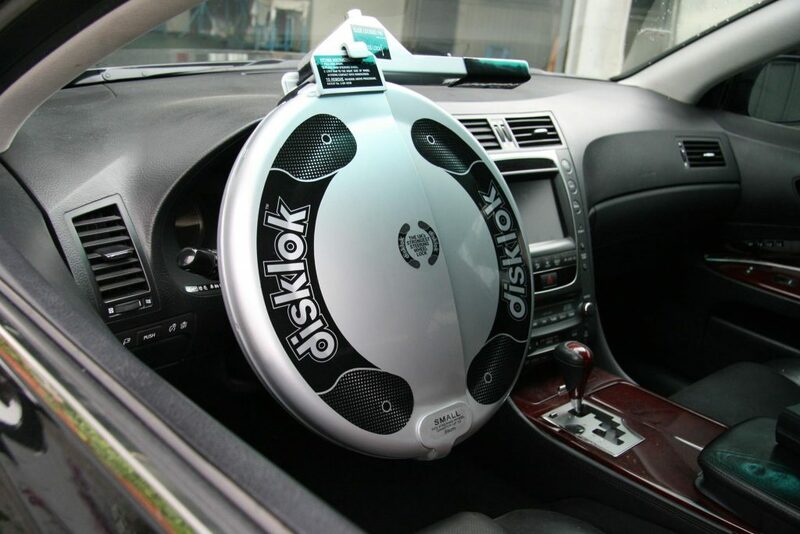 The Disklok is a premium steering wheel lock that covers the whole of the steering wheel. It is available in three different sizes that include 13.7 to 15.3 inches, 15.4 to 16.3 inches and 16.4 to 17.7 inches. As it completely encloses your steering wheel, its important that you take measurement before purchasing. The lock of the Disklok device is not only hardened but it also has an anti-drilling and anti-pick design. Even the most experienced criminal would find it difficult to bypass this steering wheel lock. Overall, the Disklok is the most expensive but it is the best steering wheel lock that you can buy and even comes with a 3 year warranty for peace of mind. It also fairly heavy at 4KG, which makes is great for protection but it does make it more of a hassle to store within the car. The Club 1010 is a mid range steering wheel lock that has a patented self locking design that is activate with a single pull. It uses a solid steel hook and a cro-moly steel construction to prevent sawing, hammering and other sorts of attacks. There are various forms of “The Club” steering locks but the 1010 model is the original and by far the best car steering wheel lock for the money. The Disklok is far too out of budget for many but this will have the same effect but at a cheaper price. Monojoy have targeted those on a budget with an affordable steering wheel lock that has heavy duty qualities such as a hardened steel construction. It can also be used as a self-defense weapon as well as an emergency safety escape hammer. Just because its a budget anti theft lock for your steering wheel, don’t expect it to break straight away. It comes with a lifetime guarantee for peace of mind, which should provide you with confidence when purchasing it. Overall, the Monojoy is a great all-round steering wheel lock and will not disappoint those looking for something basic and affordable. The Club CL303 is a different style of lock that attaches from the steering wheel and then to the brake or clutch pedal. This make it impossible to steer, stop or start the car whilst it is locked in place. For those looking for this style of anti theft, The Club CL303 is the best steering wheel to foot pedal lock. One drawback is that it may not be seen by the thief and not act as a deterrent unlike alternatives that wrap across the full steering wheel. The AUTOLOVER is a steering wheel lock that is a universal fit that is compact, easy to install and automatically locks in place. The heavy duty locking mechanism design is also vinyl coated to avoid any damage to the steering wheel. Overall, the AUTOLOVER rotary steering lock is a great choice for those on a budget that are looking for a simple and compact design. One drawback of the compact design is that it may not be suitable for larger steering wheels, so it’s important that you check the dimensions. Unfortunately, the rate at which car thefts are occurring in the US is on the rise but it is the same story worldwide. Criminals are bypassing all the cars security by taking advantage of the keyless entry vulnerability. The use of a steering wheel lock can help prevent your car becoming stolen as the criminal will look for an easier target without a lock. There is a range of different types of steering locks available that are suited to a range of different vehicles. To help you make an informed buying decision, we have produced the below buying guide regarding steering wheel locks. When it comes to choosing the steering wheel lock that you want to use, you will have the choice of three different types. These include the traditional, wheel to pedal and fully enclosed lock. The traditional lock is by far the most popular and they use a bar that attaches to the wheel via hooks and extends across. The wheel to pedal lock uses a bar that connects to the steering wheel but instead of extending across, it hooks down to the foot pedals. This prevents the criminal not only steering the vehicle but also releasing the brake pedal. Enclosed locks such as the photo below completely covers the steering wheel via a harden shell, which is often made out of steel. They are heavy duty and by far the best steering wheel lock type but it can be rather awkward to store in the car. Many steering locks come with a range of additional features such as their very own alarm siren and even flashing LED lights. These add to the extra security but you will often pay a premium for these extra features. Some of the early versions of steering wheel locks were hard to install and remove. However, thanks to modern technology and plenty of testing, they have improved greatly. Most come with great anti-drilling or picking locks that are a nightmare for criminals trying to remove the lock. However, as the car owner you only need one key and they simply unlock or lock with ease. They take less than 30 seconds to install or remove and are far easier to use than you would think. To avoid causing any damage to your steering wheel, we advice that you take your time installing or removing it. If you are that worried, you can even cover the steering wheel with fabric or cloth prior to using the steering wheel lock. Unlike the Disklok that is clearly visible due to the sheer size of it, many are not as visible. Most manufacturers will use a bright color such as red or yellow in order to make it more visible to the potential criminal. If it is a dark color, it may be missed and they may break the window before they see it. Police are recommending steering wheel locks to help lower the rate at which cars are being broken into because currently it is at an all time high. Although most steering wheel lock manufacturers state that their devices are universal, it is not always the case. For example, some cars have paddle shifters very close to the steering wheel, which can make it difficult to place the lock onto the steering wheel. Some people also install paddle shifter extenders, which make it near enough impossible to use a steering wheel lock. Another compatibility issue that you may come across is that some anti theft steering locks may only work with left-hand or right-hand drive vehicles. The manufacturer will clearly state this on the packaging. Before purchasing any steering locks that provide full coverage, you will want to measure the diameter of steering wheel. Once you have this measurement, you will be able to ensure that the lock will be a perfect fit. The major drawback of the rated Thatcham approved steering wheel locks is the size. The majority of people will store the lock inside their car but if the lock is too big, it can be an issue when it comes to storing it. Storing the lock down the side or behind your seat is the best option. Having it close to hand means you do not need to get out of your car and it can be used for situations such as self-defense or escaping through your car window. The increase of keyless robberies has meant that people are moving backwards and turning to old fashioned security methods. The best steering lock can stop your pride and joy being stolen as well as acting as a deterrent to potential criminals. Investing in the best car alarm possible is highly recommended but further protecting it with a steering wheel lock is highly recommended. All of our recommendations are suited towards a range of different budgets and steering wheels. I have a Northants Mercedes autosleeper motorhome which I would like to buy a good quality anti-theft device for.I would be very grateful if you could point me in the right direction. The Disklok Steering Wheel Lock would be ideal. It may take time putting it on and off but it covers the whole steering wheel and its far harder to remove without the key!